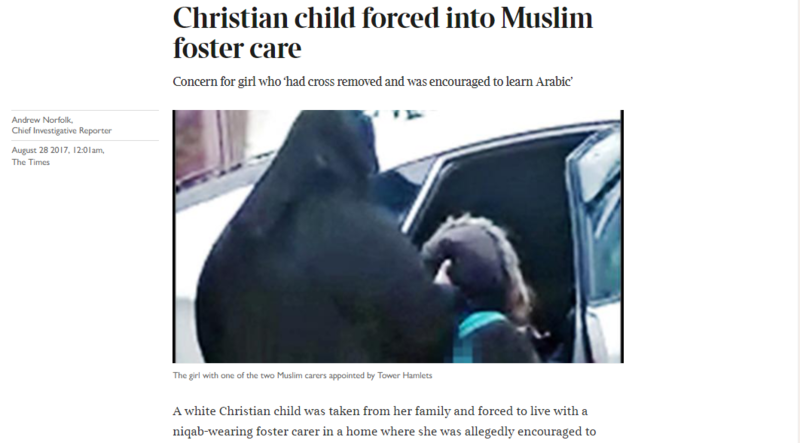 In August, the Times’s front-page story was “Christian girl forced into Muslim foster care”. It was followed by a series of high-profile stories, with the paper proudly vindicating itself by declaring: “Judge rules child must leave Muslim foster parents.” The headlines created an almighty media stink. Yet we now know from the court that far from being a child wrongly placed with unfit parents, as was reported, the five-year-old girl actually had a “warm relationship” with her Muslim carers and misses them. In its attempt to create a storm, the Times not only attacked thousands of foster parents whose sacrifices are essential yet rarely acknowledged, it did so in a way that was framed as a clash of religions: one that appeared to give supremacy to a white Christian girl over a backward Muslim family, and one that seems to have forgotten that more than 1,500 young Muslim children have spent time in care at non-Muslim homes. Contrary to claims, the foster family did speak English, the child was not denied certain foods for religious reasons and, while a long necklace was removed from her, this was because her carer was worried it posed a safety risk, not because of imagined religious strictures. The coverage of this story was an opportunity to raise serious issues: given the ultimate goal of safeguarding a young child in need, how much importance should be given to the cultural and religious match with the young child for a short-term placement? And what should be the criteria for recruiting foster parents given the huge shortage in the sector? Yet if this was the aim, why were the voices of foster parents such as Martin Barrowand Esmat Jeraj not sought – individuals whose homes were shared with vulnerable young children of different cultures? Why were independent providers of foster care and advisory groups such as the Fostering Network not cited? They later joined over 20 others in a statement calling out the Times’s “divisive reporting”. The reality is that these critical voices were ignored. The man heading the government’s review into fostering, Martin Narey, recognised how the coverage by the Times and others could deter people from ethnic minorities from offering their services – with “disastrous” consequences. Many others point out that British Muslims, who choose to open their homes and hearts to vulnerable children regardless of faith, are now at risk of social castigation or suspicion. So how did the Times get it so wrong, now that more of the facts of the case have been laid bare for the world to see? After all, the man responsible for these stories was none other than Andrew Norfolk, the award-winning journalist who rightly and fearlessly exposed the Rotherham grooming scandal. Yet if Norfolk was trying to replicate his northern success in east London, he was wide of the mark. In the wider coverage of this non-story, it felt as if some people thought Muslims were unfit to be foster parents. If they must be entrusted with children other than their own, they must pass an arbitrary “I am not an Islamist test” set by the Times. The so-called fear of reporting on Muslims clearly does not exist – as evidenced by alarmist headlines in the Times and its sister paper, the Sunday Times: from the false claim that “Enclaves of Islam see UK as 75% Muslim” to unjustifiably calling a Muslim school “Islamist” or scaremongering that Muslims are “silent on terror”. Taken alongside these headlines, the Times’s story on Muslim fostering follows a disreputable pattern of baiting Muslims. But it is not only the Times whose reputation has been severely damaged as the paper continued its coverage without any retraction, apology or remorse. Sky News, for instance, appeared to initially parrot the Times’s narrative without the scrutiny that the BBC provided. The Sun’s political editor, Tom Newton Dunn, appearing on Sky News’s Press Preview, claimed that there should be the same level of outrage if a child brought up as a Muslim was placed into a strict Christian family, apparently oblivious to the fact this has occurred on multiple occasions. Meanwhile Trevor Phillips, the former head of the Commission for Racial Equality, contributed to the circus by making a number of misleading claims on the pages of the Sun. Phillips labelled the local council at the heart of this case as “pro-Muslim”, likening their actions to “child abuse”, while attacking the real experts voicing concern at the coverage as “hypocrites”. And the cherry on the proverbial cake was the press regulator IPSO’s refusal to take any action. In a letter sent to complainants, its executive claimed that it could not investigate and publicly rule on the inaccuracies because of “the effect … this coverage may have on those involved in the case, and particularly the child”. It has, in effect, absolved itself of the responsibility of doing its job and regulating the press invasion of the child’s privacy by citing that very same child’s privacy. There are a number of social issues that require careful journalistic investigation and proper scrutiny. But this episode reveals a baser journalistic instinct – Muslim wrongdoing, whether real or imagined, sells. It conforms to the narrative that there is something about Muslims and their faith that is not quite British, not quite modern. The way in which this issue is reported by some newspapers may help explain why trust in the profession languishes behind even that in estate agents and bankers. And this affects too the many journalists who have reported this story so diligently. We cannot let them get away with it.